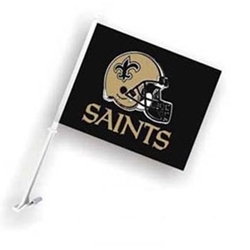 Let your New Orleans Saints team pride fly with this large 14.5" x 11.5" Saints car window flags. Car Flags are a great way to show your team support at a tailgate event or even on daily commute. Our Saints car flag is made of washable satin polyester making it perfect to withstand the toughest competition or weather. Order your Saints Car flag today!